Lake Tahoe is beautiful – let’s start there. And with 18 ski areas within an hour’s drive and big names like Heavenly and Squaw, its as clear as the western sky and the brilliant waters why skiers should put Lake Tahoe on their must ski radar. Lake Tahoe is a year round playground where the mountains meet the shores, and the sun shines over 300 days of the year. Lake Tahoe’s ski resorts are where its at in winter, with celebrities and pro skiers and riders alike congregating for sun, snow and a social scene not to be missed. In fact, Lake Tahoe is campaigning to host the 2022 Winter Olympic Games, like Squaw Valley did in 1960. Families will love the extensive Tahoe ski terrain, and copious terrain parks Northstar, which now features a Ritz Carlton Highlands on the slopes and a resort village at the base. You can ski from California to Nevada at aptly named Heavenly. 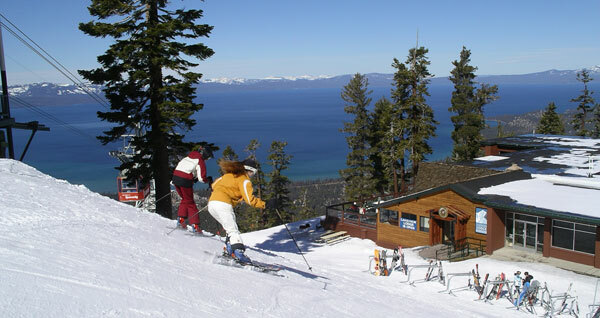 Be sure to check out Kirkwood at South Lake Tahoe, then Alpine Meadows and Squaw Valley which are now merged and called Squaw Alpine, and more humble Homewood, Sugarbowl, Incline Village, Mount Rose, and Diamond Peak in North Lake Tahoe…see our reviews on Lake Tahoe skiing in California.